Denny Jump (Bellevue, WA, United States) on 14 September 2018 in Plant & Nature. A beautiful evening and Sunset over Lake Washington. 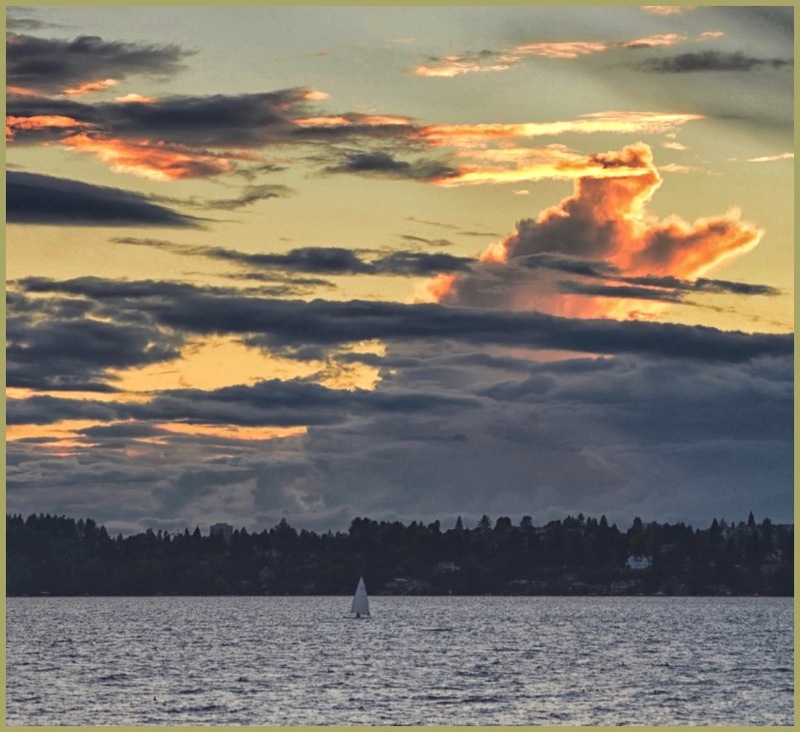 As we stand in Kirkland - a city on the eastern shore of this beautiful lake - we enjoy the sunset that we are blessed with....A lone sailboat rides the waves under clouds lined with blazing colors. Meanwhile, 3,000 miles to the east, the States of North Carolina, South Carolina, Virginia and others are preparing, as best they can, for a monstrous hurricane that is moving slowly, thereby creating even more damage and devastation. And so as we enjoy the sunset here, we pray for our friends and relatives on the Carolin coastline. Be Safe! Yes, the climate bites back at times and I see they are saying a million people along the coastlines there have been ordered to evacuate. @Ronnie 2¢: And the storm is still there....as well as the people!!! egads!! A vast and wonderful image here, Denny, and yes our thoughts and hopes are with the states in the path of big and nasty Florence. Hurricane season is always such a scary time. A beautiful image. People had best be away from the coast although I hear of rescues of those who didn't evacuate. A gorgeous image. Every year at this time, there is so much damage and devastation from these monstrous storms. I miss talking to you too Denny. I hope that you are doing well. @Elaine Hancock: Thank you, Elaine!!! I hope you are doing ok...And You are not so far from the edges of hat storm...stay safe!! @Darkelf Photography: Thank you so much, sir ...HaHa....I JUST left one of my patented endless essays on YOUR page ;-) Cheers, sir! Oh yes we are all thinking so deeply to them all wishing the wind a calmer mood ! Love your rich skies and the peace above, inspiring and supportive image ! Love my friend to U and yours !